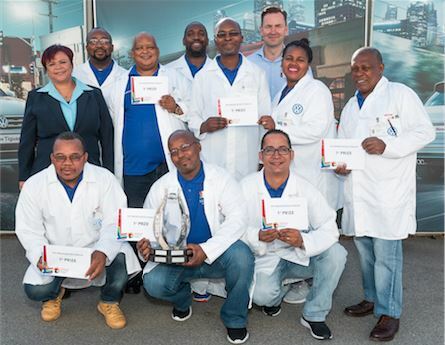 Volkswagen South Africa says that its Problem Solving Team Programme has, over the past six years, improved work times and ergonomics resulting in financial savings. The programme is described as a tool that encourages employees to look at their work environment and processes and find ways to improve them. The teams presented their identified problem, along with a method and their solution to the VWSA Board of Management, Production Management and their colleagues in early July. The winners for this first cycle of 2017 were 'The Myth Busters' from the Press Shop. The team identified a problem which highlighted unnecessary steps being taken during a pack change in the robot cell which led to time wasting and poor ergonomics. A pack contains the metal sheets which the robot picks up to place in the press and is changed 4 times during an 8 hour shift. The solution was to eliminate the unnecessary steps taken in the robot cell and by doing this they improved the ergonomics by 60% and reduced the number of physical steps taken during a pack change from 172 to 112 steps. The improvement also resulted in a saving of approximately 17.8 minutes per shift which allows increased press parts per shift. "The PST Finals are always a highlight on our calendar for me. I am proud to have employees who are interested and take ownership of their work area and processes. They are continually aiming to improve the space they work in. We are also the first production plant in the VW Group to have introduced a problem solving programme at shop floor level where operators identify their own problems, solve them and then present improvement results to the Board of Directors," said Thomas Schaefer, Volkswagen Group South Africa Chairman and Managing Director.